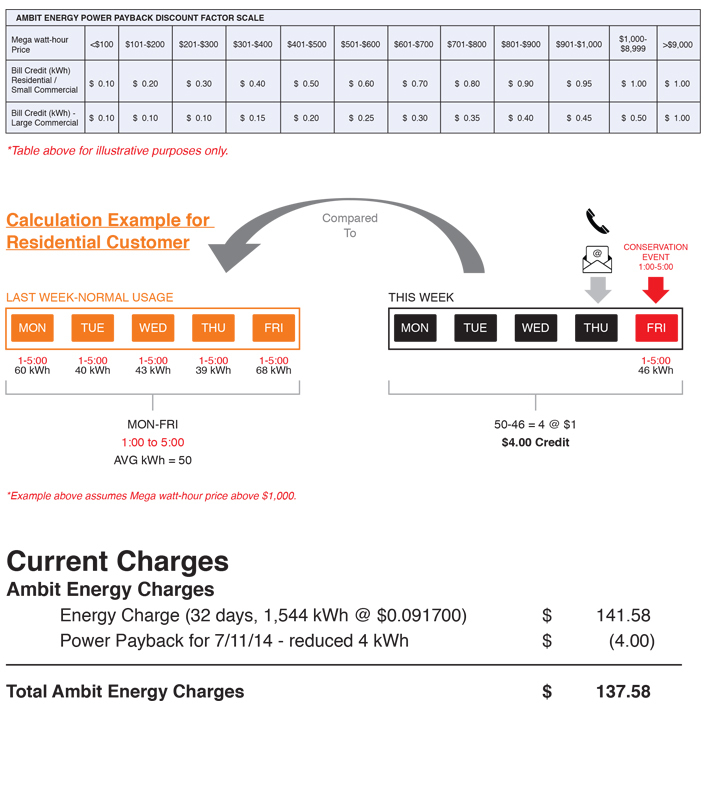 With Ambit Energy’s Power Payback™, any Ambit Customer in Texas with a Smart Meter can get paid for doing what you already want to do — lower your electric bill. You’ll also help the state of Texas conserve energy and potentially avoid rolling blackouts. There’s no sign-up or hassles. Here’s how it works. We’ll give you advanced notice of an approaching period of extreme electricity demand by email or phone. 2. You Reduce Your Usage. During the designated time, cut your electricity usage by adjusting your thermostat, turning off appliances, pool pumps and other household items, as well as taking these other steps. If your usage during these hours is lower than your average from the same time period over the previous five weekdays, we’ll give you a bill credit of up to $1.00 for every kilowatt-hour saved. 3. Cha-ching! Collect Your Bill Credit! We’ll apply the credit of up to $1.00 for every kilowatt-hour you save during the designated time to your bill within the next three billing cycles. We’ll track everything; all you have to do is save. I’ve got more questions about Power Payback™. Still have more questions? Check out the FAQs below. What is the Power Payback™ program? The Power Payback™ program rewards you for doing something you already want to do—lower your energy bills. You’ll also help avoid brownouts and rolling blackouts by actively managing your power usage during defined period of high electricity demand. Before an anticipated peak demand period, we’ll notify you by email or phone. You can take steps to cut back on your electricity usage during the defined time period, and if your energy usage during that time is less than your previous five-day average for the same time of day, we’ll credit you up to $1.00 for every kWh saved. Getting paid to save is just what you’d expect from the company that brought you Free Energy. Texas Customers who have a Smart Meter and who have received notification of a period of extreme electricity demand. No special equipment is required other than a Smart Meter provided by your Transmission Distribution Utility. How will I know when I need to cut back on my electricity? We’ll notify you by email or phone as soon as we are aware of a potential period of extreme electricity demand. To ensure you receive your notifications, please confirm your email or phone contact information is up-to-date in MyAmbit Account. What are some ways that I can reduce my electricity consumption? You can set your thermostat a little higher, avoid washing and drying clothes, unplug unnecessary appliances and other household items, use ceiling fans to cool your home, and schedule meal preparation for the cooler times of the day. If you have a pool, turn off the pump. Check out Ambit resources like The Spark and MyAmbit Account for other energy-saving ideas. How will I know if I qualified to receive a credit? We’ll send you an email a few days after the period of extreme electricity demand letting you know you’ve qualified for a bill credit. How is the bill credit calculated? We compare your usage during the defined period of high electricity demand against the previous five weekday average for the same time of day. We will then multiply the number of kilowatt hours saved times the Power Payback™ discount (up to $1.00) to get the total bill credit. When will I see the bill credits posted on my bill? You’ll receive your bill credit within three billing cycles. I didn’t receive any notification regarding a period of extreme electricity demand. How can I ensure that I receive a notification in the future? Make sure your email address is current by logging into your MyAmbit Account and by adding comms@ambitenergy.com to your email contact list.